I was introduced to Korean food by my friend Jessica Lee Binder. She took me to a restaurant in the Korean area (the West 30’s in NYC where there are 44 Korean restaurants and some Korean grocery stores) that was up a flight of stairs and in my whole life I would never have thought of going. It was/is called Seoul Garden and is a lovely, peaceful atmosphere (but that might have been because we were there on an off hour) with incredibly delicious food. Going out with Jess is always an adventure because in addition to being incredibly knowledgeable about food of all types, she also has a hollow leg and orders for us way more food than any four people could possibly eat in one sitting. That way we taste many different items and she gets to eat her fill – and remain thin…while I remain not thin…I don’t know how she does it. About the food. First the restaurant puts about 5 small dishes of various items on the table for you to begin with. Of course one or two of them are some form of kimchi (very hot pickled cabbage), there was some kind of fried vegetable fritter/pancake as well other things I was not familiar with. Then came this stone bowl with stewy tofu and veges and a raw egg that you crack into the stew – it was amazing. There was a noodle dish that was a little bland but perked up with some kimchi and then there was the kalbi that I just fell in love with. I have returned to the restaurant quite a few times but since going first gluten free, then paleo, Korean (and most Asian) food is out because of all the soy sauce. 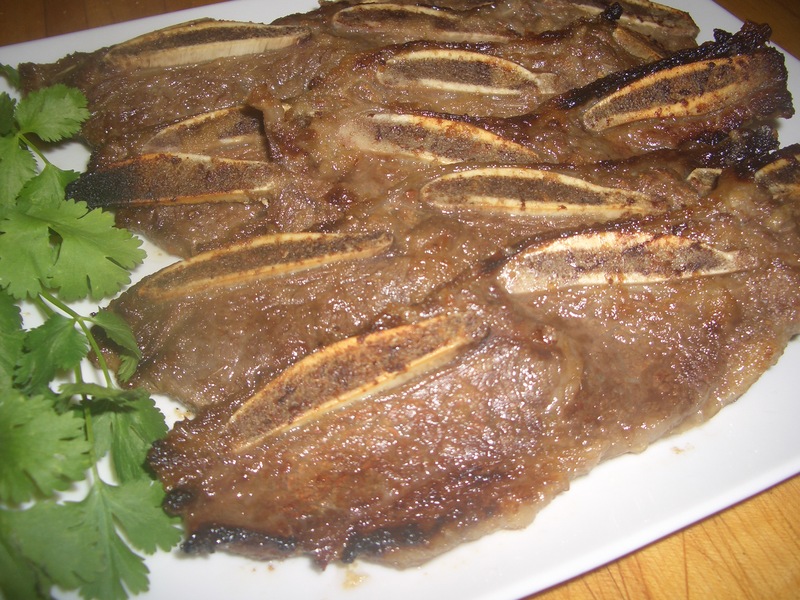 So it is my intention to recreate many of my favorite dishes using paleo (and therefore gluten free) ingredients – this Kalbi just being the first. ENJOY!!! 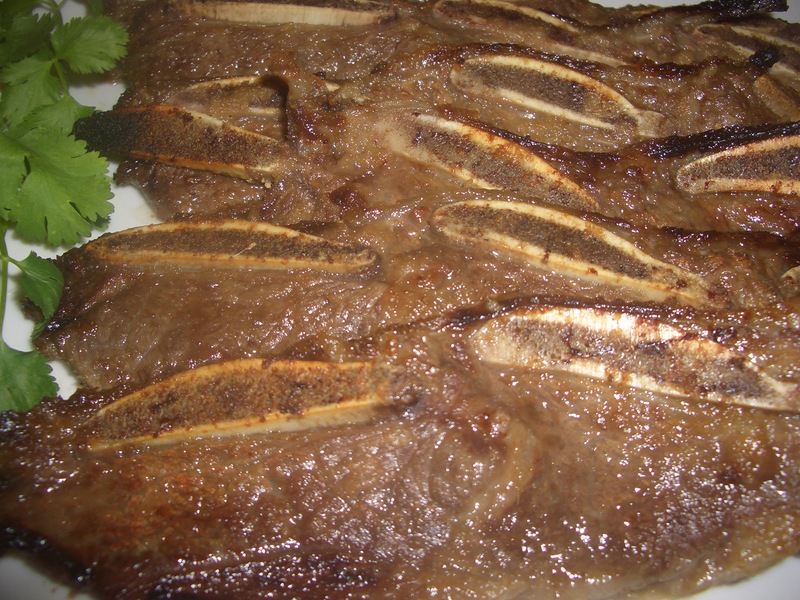 Kalbi is made with thinly sliced flanken or flanken-style short ribs. Ask your butcher if he can cut them for you. Otherwise any tender cut of beef would probably do. 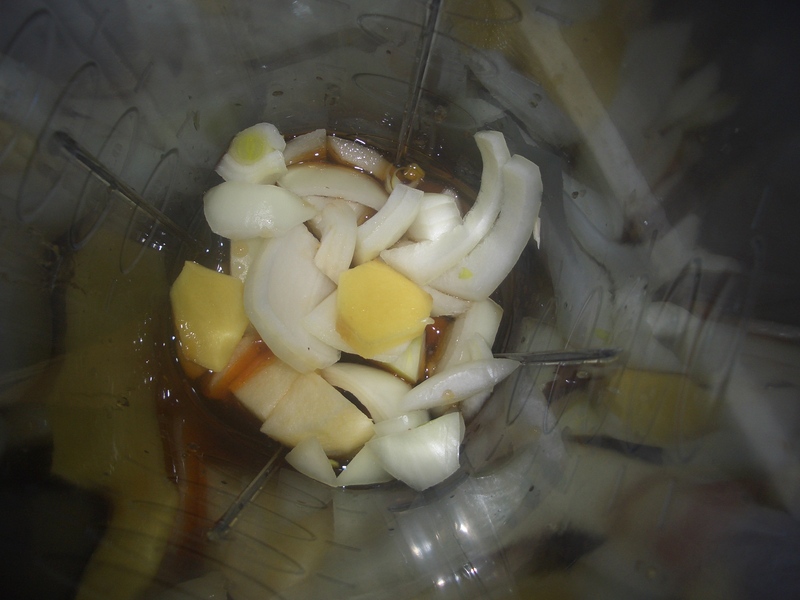 Place the onion, apple, coconut aminos, maple syrup, vinegar, ginger, garlic, sesame oil, marmite, and chili oil into a blender container. 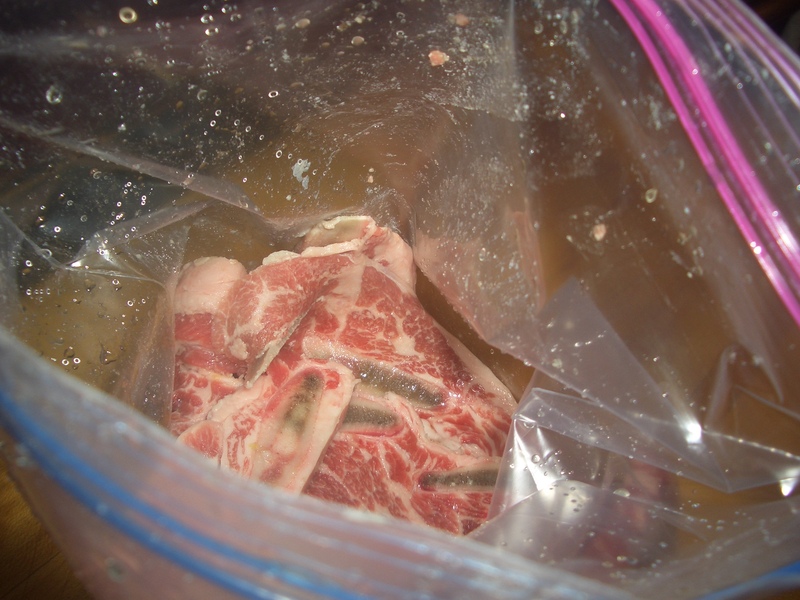 Rinse the ribs, place in a ziplock plastic bag. 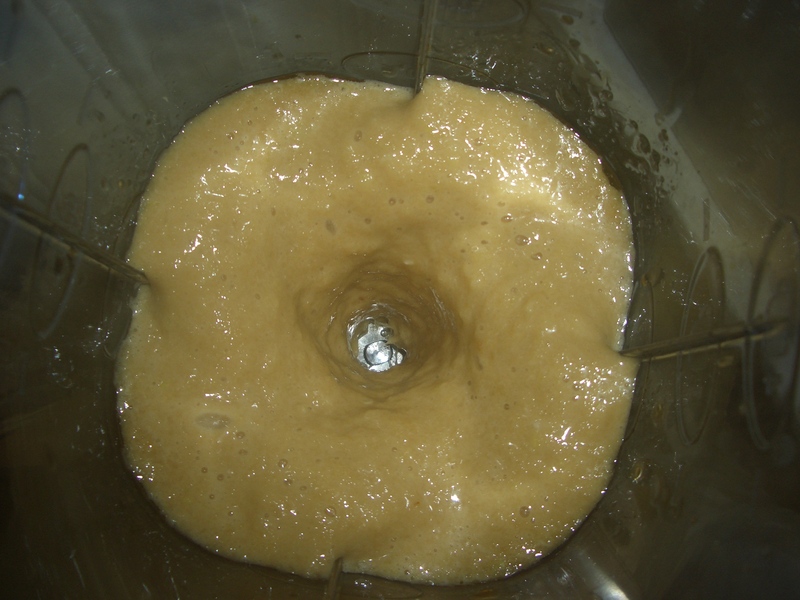 Pour in the puree and sesame seeds. 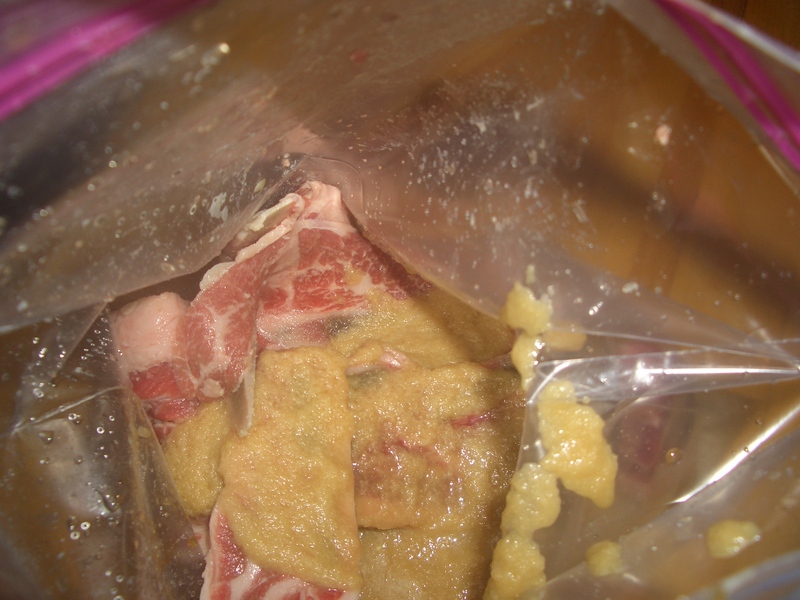 Seal bag and refrigerate at least 2 hours, preferable overnight. 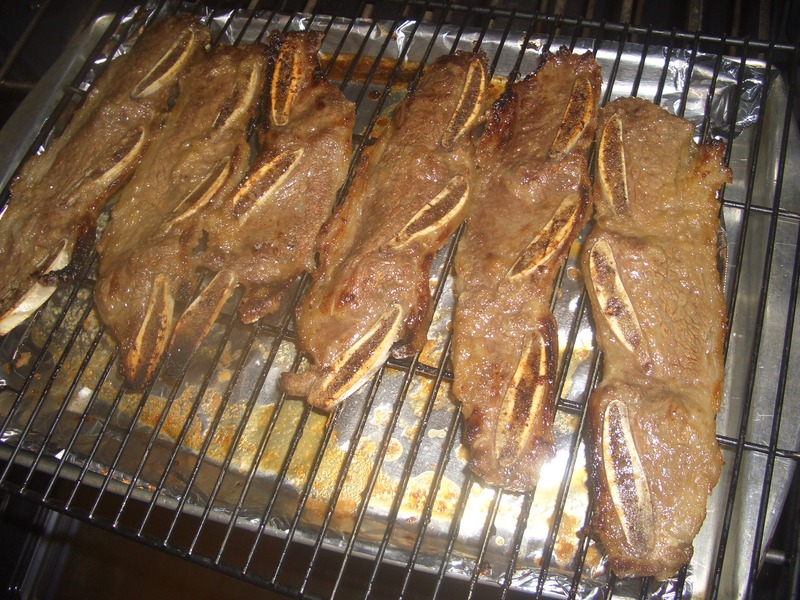 Preheat broiler or grill. Line a broiling pan with foil. 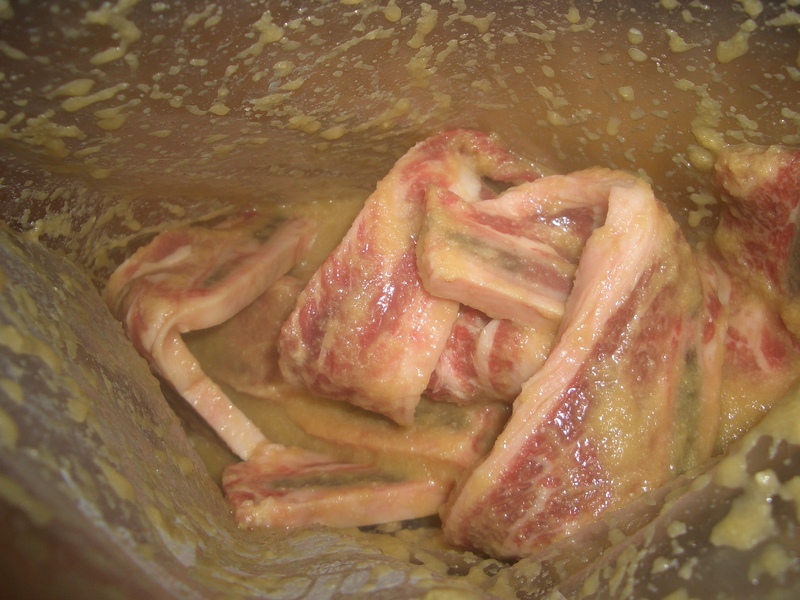 Place the meat on a rack in the pan and broil until browned. Turn and cook second side.